and exciting school group tours! To book your Hunley tour, call 843.743.4865, x14. Discounted price for students, teachers and chaperones. Tour can be targeted toward particular area of study. The Warren Lasch Conservation Center, home to the H. L. Hunley submarine, in Charleston, South Carolina offers an exciting opportunity for students to learn about a wide array of academic fields, including history, archaeology, forensics, and preservation science. Enjoy this unique educational experience during our weekday, private tours for school groups. School groups are given a special discounted price. In advance of your visit, our staff will work with you to ensure the docent-guided tour is geared toward your classroom’s specific area of focus. We can also provide starter curriculum and a list of supplementary resources for a variety of age groups. A visit to the Hunley explores a wide array of exciting areas of study that can be incorporated into your classroom environment. History: The American Civil War was a turning point in maritime history, and the Hunley represents perhaps one of the most important discoveries in naval warfare in the 19th century. Students will learn about the Civil War, the wartime South and how the Union’s blockade of the ports led to technological breakthroughs. Conservation: The Hunley was lost for over 130 years. During that time, salts infiltrated the Hunley’s iron skin and threatened her survival. To ensure the world’s first successful combat submarine is preserved for future generations, conservators are working to preserve the Hunley and the hundreds of artifacts found onboard. Archaeology: The Hunley was in essence a time capsule, holding the remains of her eight-man crew and a wide array of items from the 19th century. The ongoing excavation of the Hunley offers a wonderful introduction to archaeology and the process of discovering the past through careful study of artifacts. See the Hunley in her 75,000 gallon conservation tank. 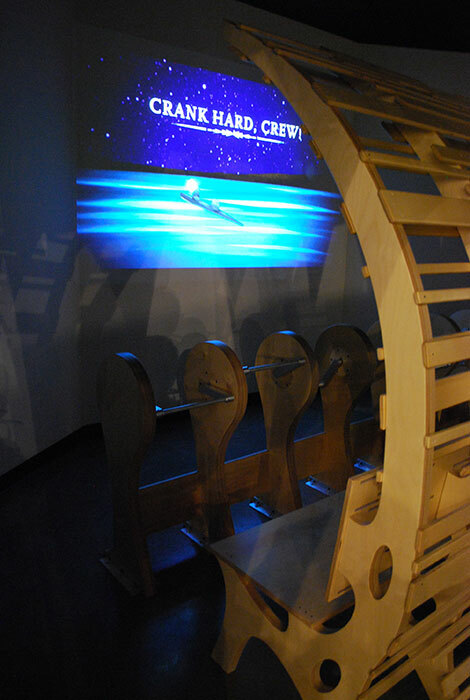 Feel what it was like to be on the Hunley through all-new interactive exhibits. Facial reconstructions of the Hunley crew. Artifacts found during excavation of the submarine, including the legendary gold coin that saved the Hunley captain's life. There are a variety of educational resources to help prepare for your school group’s visit to the Hunley lab and to develop post-educational curriculum.